The Grandhotel Pupp First Class Karlovy Vary is located within the town itself but enjoys a tranquil setting. This provider of Karlovy Vary accommodation is set within the forest, offering a relaxing and rejuvenating experience From the Grandhotel Pupp First Class Karlovy Vary, the nearest airport is the Karlovy Vary International, located approximately 3 miles outside the city center. 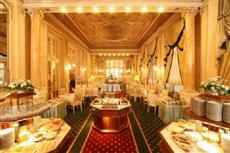 The Grandhotel Pupp First Class Karlovy Vary contains rooms provided with modern amenities. There is satellite television service included in every room. There are also pay-per-view options. The hotel provides each guestroom with a private bath. Other amenities include telephones and radios. The Grandhotel Pupp First Class Karlovy Vary contains numerous amenities onsite. There are full spa services available which include a Roman bath, a salon, a spa clinic and a relaxation center. The hotel offers guests several different restaurants from which they may choose. Guests who arrive at the facility in their own vehicles will find guarded parking available for an additional charge. The hotel allows children 3 or younger to stay with their parents at no extra charge.